Does anyone know if the institution of heraldry rules for CAP has been proposed? I think it would be a good idea. I understand some wings have their own standards of heraldry (according to the WG/CC, since he/she is the final authority on unit patches), but I'm talking about heraldry rules from national, for all levels of command within the organization. Besides, discs look better for squadron patches . I post this knowing full well we are not bound by them, however as indicated the tradition, affinity, and (now) awareness of them by Wing CC's >is< an issue these days. I also stand (semi-)corrected, while blue, yellow, and white are indicated as "should", there's no specific as to where, nor do they use the term "will", and there doesn't appear to be any indication how/where the colors should be used. The colors of an emblem often have significance but that is always secondary to the symbolism of the emblem. The colors of the Air Force, ultramarine blue and Air Force yellow, should appear in the design;the blue represents "the sky", the primary theater of Air Force operations, while Air Force yellow represents "the sun" and the excellence required of Air Force personnel. A note of caution, ultramarine blue, while it represents the sky, is not a light blue; an ultramarine blue shield or disc is fairly dark and requires charges of good contrast. A rule of thumb when assigning color to design elements is to use colors that contrast: dark on light, light on dark. Heraldry divides colors into metals -- gold (yellows) and silver (white, silver gray) -- and colors (reds, blues, greens). The cardinal rule of heraldry is no metal on metal and no color on color. This site has excellent information and is a good guide for any new unit insignia. If you follow their examples it would be hard to make a bad design. Too busy is generally what get most people in trouble. Hey, if the color or symbol has significance for your unit - use it. That's the whole point of these patches. To represent/symbolize something of significance with regards to your unit. Though I do recommend that squadrons use the circle-shaped patch to follow USAF heraldry guidelines. Our Group HQ patch design had been around a long time, but on a non-standard shape. In December, they updated the design by just placing it "into" the heater-shaped shield to make it "compliant." Say, do you know if anyone has proposed that AF heraldry rules be instituted by CAP? I've been trying to figure this out. I don't think it would be too difficult for CAP to do, since so there are so many uniform changes that have been made already. OK, just to "put on the black hat..."
1) How many unit currently have produced patches on uniforms that do not comply with what is likely to be the adopted standard? 2) Is this number significant to cause backlash? 3) What would the USAF like to see in patches for CAP? 4) Are unit patches going to even remain in the uniform lexicon? I can see it moving to where individual unit patches get "bumped off." Remember...this is a "black hat" post, not a negative. The idea is to find creative solutions to potential problems. Please, don't take this as a "let's shoot it down" post. I don't see unit insignias going anywhere anytime soon. As for phase-in of standard shapes, very few couldn't be easily altered to the new shape, and you simply require that the next time patches are ordered they be the "correct" shape, etc. If you look at historic insignia, especially from WWII, a lot were home-grown, and then phased out over the years. Ours uses the MAJCOM Style, like AF chest patches. Here is an old patch from my squadron. Unfortunately it was changed by a former commander for some reason to something that was pretty lame since it has no heraldry that I can find. That's funny - 64th TAS was a 130 unit out of O'Hare, which my buddy and his brother were in. It was the basis for the Palwaukee insignia, and is even referenced in the approved definition. Rockers: Blaze orange as an homage to the 64th Tactical Airlift Squadron (deactivated 31 March 1997) formerly based at O’Hare Airport. I know of no such efforts currently in the works. However, I am certainly by no means omniscient, and there could be a proposal or two floating around in development out there. I have heard unconfirmed RUMINT from several sources that some Wing Commanders have currently or have in the past only approved designs submitted to them if they complied with USAF guidelines. That certainly is within the realm of control for each Wing CC. Backlash? Dude, what are you talking about? If CAP implemented heraldry guidelines for unit patches, there would obviously be a grandfathered-in policy for existing unit patches already in wear/use. Thus, you avoid backlash potential. You mean, if they cared? Since the USAF is abandoning all patches, including unit patches, on the ABU and the only unit patches remaining would be on the flight suit - I doubt if they care that much. If they did, though, I imagine they'd like to see us meet their guidelines and standards. Again, USAF is moving away from them in the ABU. But they'll remain on flight suits and they'll certainly remain on unit memorbilia (mugs, t-shirts, on walls and podiums, on challenge coins, etc.). No reason to abandon a symbol of your unit, just because you don't wear it on your BDUs. There are plenty of other places you can use such a symbol to built unit pride, morale, and cohesion. I think such a policy in CAP would be a good thing, but it might just be easier to educate Wing CC's on standards and ask they only approve those that meet the guidelines. I don't know, but if I had to take a guess, I'd say at least 70% of patches in CAP. Depends on whether or not CAP institutes AF heraldry rules. Obviously, folks will not want to change their unit/group/wing patches to match the style of those of the Air Force. Why? Because we're talking about a lot of money here. Thought the "U.S. Civil Air Patrol" BDU branch tapes were expensive for people? Wait until the majority of units/groups/wings in CAP have to redesign their patches! I'm all for the idea, I just don't think it would be popular. Don't know. If I was the CSAF, I'd want CAP to follow the Air Force standards, as CAP is the USAF Auxiliary (even if for only a small fraction of the time). The Air Force does seem to be moving in that direction with regard to the new ABU, which will have no patches at all. Now, The Air Force will continue to wear unit patches on the flight suit, but CAP won't have that option until National authorizes them on the flight suit again. I hope that happens soon. Squadron patches are good for morale, no matter what uniform they're on. No worries, sir. Got no reason to think it's a "let's shoot it down" post. I wouldn't be surprised to find that USAF decides to continue with the unit patches as the ABU gets implemented. Since the new service coat is designed around heritage, someone will eventually argue the same for the unit patches and return them. All it takes is a stroke of the pen from the next USAF CC as McPeak's uniform has been changed each time. Does this help? I received this information almost 11 years ago, and sometimes it pays to hang on to it for just this reason - when we forget where we have been. "The essential design of the Prince William Composite Squadron crest emulates a royal coat of arms. Adopting this style pays tribute to the unit's namesake, Prince William, the Duke of Cumberland (1721-1765) and to the county in Virginia named for him which is the unit's home. The depiction of a knight's helmet in the lower sector of the crest reminds us of a heritage of chivalry." "The central feature of the crest is the chevron. Deviding the crest into sectors, it resembles an arrow pointing skyward, and symbolizes the unit's continuing efforts toward betterment. The checkered pattern of the chevron is reminiscent of the checkered flag marking the end of a race for a triumphant competitor. As a competitive spirit is the cornerstone of Prince William's strategy for achievement, this pattern is very significant." "Three start adorn the upper sector of the crest. These, of course, symbolize the three missions of Civil Air Patrol: Aerospace Education, the Cadet Program, and Emergency Services. The combination of the chevron and the stars captures the essence of the unit's adopted motto: "Ad Astra Per Aspera". Translated from Latin, this means: "To The Stars We Aspire". Our motto indicates the high standards expected of Prince William's members." "The stars also reflect Prince William's commitment to excellence in all three endeavors. They are patterned after the ancient mariner's compass rose in the hope that we may never lose our way in the arduous journey toward these lofty goals." The squadron crest was designed by former Squadron Commander, Lt Col B.T. 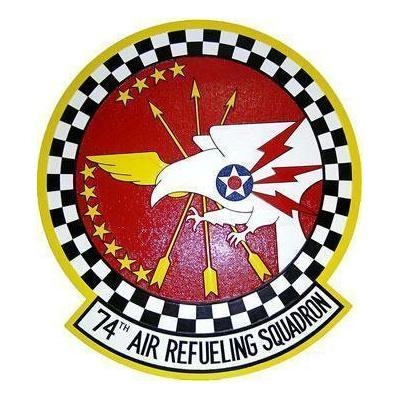 Marking, and was approved for use as a squadron patch by the Virginia Wing uniform committee on May 5, 1989." DOES Civil Air Patrol impliment any standardization on unit patches and insignia? No. But we DO have rules in place that require several levels of the unit's chain-of-command to approve a design first, and that is good enough to maintain some king of control. SHOULD Civil Air Patrol impliment a standardization on unit patches and insignia? No, because it would be to "solve" a problem that doesn't even exsist. WILL Civil Air Patrol impliment a standardization on unit patches and insignia? Nope. It has already been suggested, requested, and officially proposed by many thoughout the years, including the CAC - all attemps at the National level have been declined. It might be a good idea for CAP to throw out some VERY SIMPLE recomendations, like every CAP emblem or patch should include a tri-prop, all parts of an emblem or patch should have meaning and purpose, and the emblem or patch should represent the location of the unit and the people that use it. But to start mandating shapes and colors? Blah! Okay, this is the shield design, but it was approved by Wing prior to creation. Our squadron was called the "Capital Squadron" prior to being re-named in honor of a member who went on to become a military aviator and was later killed in action. But its a nice looking patch. I don't think there is a "problem" per se with patch designs. Its more the opinion of the members here that they patches should conform to the USAF guidelines in shape. Disc for Sq level and Shield for Command level. I don't think content should be mandated (3 bladed prop). From what we have seen from folks that have submitted examples of their patches, all are unique to their units and have representative colors and symbols in them. If you place requirements, other that "appropriate content" then you stifle the creativity of the units in representing themselves in ways unique to themselves.The patch is worn on a CAP uniform so I don't think it has to indicate CAP or contain trademark symbols of CAP in it. This concept is inline with USAF guidelines for design. If you look at the myriad of USAF patches out there, few say USAF on them (except where required due to level of the unit) or have the "trademarks" of the service(the winged star device). Totally agree, we should not limit the creativity of each unit to design their own patch in a way that properly represents them. I'd probably put shape in there too, and can post some really unique non-traditional ones here if anyone wants to see them. Our longest standing patches obviously date from our roots as part of the Army Air Corps, and tend to even be similar to each local echelon of that organization. Although the majority of wing patches are round, there are some shield-shape wing patches: IN, KY, MI, DC, PR, and VT. CA and IL are a stretch, TN used to have a shield before they changed to version 3 which is rectangle. None are USAF style shields. I'd have to double check, but I think the original Communications patch was the first USAF-type shield used in CAP before being changed in the late-80s. Heck, SWR just made a brand new disk-shape patch... Oops! If you've ever seen USAF Group or Wing "pizza" patches before, those are almost always round. Even though rarely worn, this breaks the shield/disk rule. I think MER might have done one long ago with all their wing patches on it - wish I had a picture. The tri-prop pre-dates anything the USAF has as symbols - even the Hap Arnold wings, and was representing us in 1939 prior to the full realization of our organization. Outside of the military, I believe the BS (non-cow type) might require the flure-de-whatever to be on all their insignia. They find some real creative, subtle, and fun ways to work it in. I like the technique of stitching on the field with the same thread color as the background... called ghosting, I believe. See what's on the oranges (also disguised as hills)? Thanks for the nice, calm, non-cranky discussion - rare on CAP message boards these days. Love the patch! Took me a minute to realize the "SAR" was a searchlight on the ground ... at first I thought it was a UFO.